This was made in Building Maker and refined in SketchUp. A Googler pointed me to a handy "how to" page HERE. 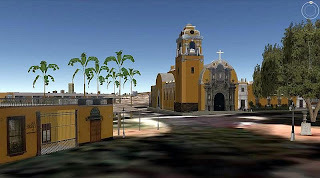 Specifically it deals with the issue of Building Maker models that, once refined in SketchUp, sink into the terrain. You can see the step that explains how to fix that as well as how to do SketchUp edits at the link. Above is an example model. 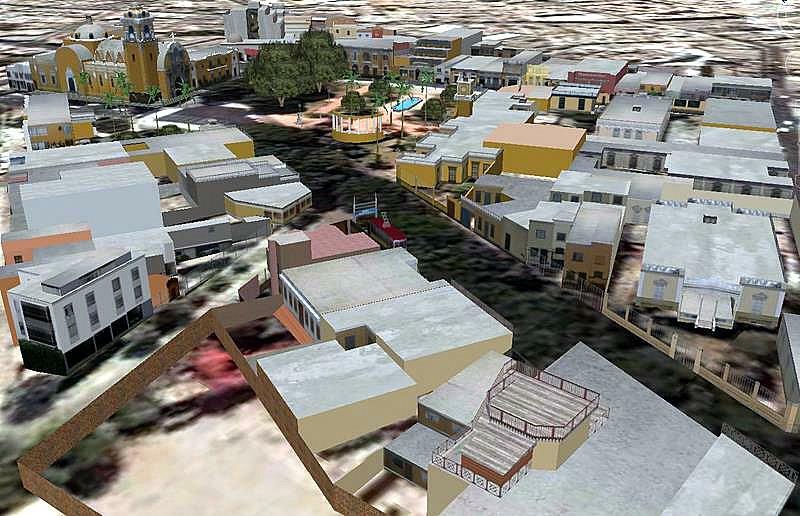 Although the version I uploaded initially from SketchUp looked OK to me and I could export a KMZ file at the correct elevation on my computer, the KMZ generated online (at the "View in Google Earth" link on the model preview page) produced a sunken model. A short edit later... and I think it's all good. He's the fastest modeling duck you've ever seen-- keep in mind his feet are webbed and his arms feathered-- and if you don't believe me watch the video. Belgian silos modeled from start to finish right before your eyes (time lapse; actual time 55 minutes). Take a look at the Google Model Your Town Competition. It's one of the larger contests I've seen offered on the 3D Warehouse, and the prize includes a ten thousand dollar donation to the winning town's public school district if in America, or equivalent if the winner is in another country. The title is Scrooge because I had to tie in the scary model with the Christmas season somehow... I just came across this one, also by Pepe (who in the last post created the beautiful SetTree3D models). This model is of the Bates Motel from Alfred Hitchcock's classic thriller, Psycho. Pepe has created not only an amazing black and white model, but also a very cool tour including key scenes from the film. The atmosphere changes during the tour and includes night scenes and rainy weather. Awesome model. EDIT: Since I mentioned Christmas, I feel I should also wish a (tardy) Happy Hanukkah to those who may be celebrating that holiday at this time. Even though these models are a couple years old, they are some of my favorites and I'd like to point them out to anyone who has not seen them (or who has not seen them in a while). These are ultra-realistic 3D winter scenes by SketchUp artist Pepe. As you can see they are unlike any other model, and really quite beautiful. Welcome and enjoy the new wintry header art for SketchUp Island. 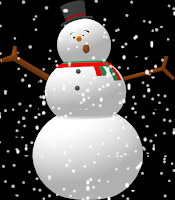 It currently features "Popsicle the Snowman" by SketchUp artist Oz The Wiz. Popsicle was of course made using Google SketchUp free software. After 5 months I’ve made a huge model. Actually, are 7 models that cover 7 blocks... I had to take more than 800 pictures to be able to reproduce with detail all buildings included. Once a town located south of Lima and accessed by train or tram, [Barranco] is now its bohemian district, full of old houses where there are restaurants, pubs and art galleries. Among its most prominent buildings, we find the City Park (1898), The Municipal Library (1922) and the Holy Cross Church (built by architect Humberto Guerra between 1944 and 1963). This is an independent project. No person or organization has supported or sponsored its creation, and is intended to call attention of institutions and authorities to preserve the monumental architecture of the district and that is in some cases very neglected and damaged. He adds that although the models of each city block are very large and detailed, "modeling techniques were used to keep all models' sizes as small as possible, all under 1 mb, some even less than 500 kb." Good job, Auquicu! Be sure to watch the Google Earth tour of the site (very relaxing with music included) at the top of the post. Click HERE to see the actual models. Labels: Buildings, Google Earth, Photography, Textures, Why Model? Gold Medal goes to Aerilius in Germany who created the menacing "Snarling Pumpkin" who is biting another pumpkin. Silver Medal goes to Cathy Tritschler of France whose terrible ogre pumpkin swallows the Earth on its tongue while looking scary at the same time. Bronze Medal goes to Tobias Merk, whose Rübengeist is not a pumpkin at all, but a fodder beet. Says Tobias of his carving, "we have a very similar custom in Germany or more specifically in Bavaria where I'm from. Instead of pumpkins our children use fodder beets for making little ghosts, which should scare away evil spirits. We call these carved beets "Rübengeister"
Excellent work everybody. All three winners will appear in the header art of this blog in the week leading up to Halloween. Additionally, Igloo Studios has donated a year's subscription and a month's subscription to their School Pro website for First and Second Place winners respectively. Thanks Mike and Alex at Igloo Studios, and thank you judges (Beryl, Jennie, Addie, Alex, Eryne, Dawn, Zack, and Mike), thank you Aidan Chopra for donating pumpkins to carve, thank you John Wilkes for providing entertaining pumpkin fiction, thanks Tasha at Google for blogging about this, and thanks to the many other people who submitted pumpkins. Did I leave anyone out? I hope you all had some fun. Peace out. Soon they'll be judged (thank you, lovely judges) and then on October 27 the winners will be announced and appear in the header of the blog here. In addition to this, Second Place winner will receive a one-month Pro account membership to Igloo Studios' School website, and First Place winner will receive a whole year's membership! Thanks to Igloo for that. Good luck, pumpkins of the World! UPDATE: The entry period has closed (one hour ago at 11:59 PM on October 24 Eastern US Time). If for some reason your pumpkin appears after that time, regardless of the upload date it won't be submitted to the judges, however it will appear in the collection with all the other pumpkins. Thanks to all participants and judges! SECOND UPDATE: Winners will be announced tomorrow (October 27) and appear in the header. Good luck! Upload trick of the day. I may be wrong about this but I don't think so... when uploading a model to the 3D Warehouse, your SketchUp window width-to-height ratio determines the ratio of your preview image. Therefore this is one more technique you can use to control how large your model appears in that window. 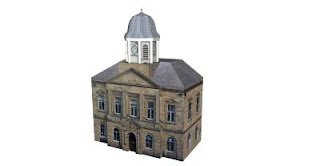 In the above example, "Kelso Town Hall" by Alistair_M, we can see the model was uploaded from a wide screen. This just in... Mike Tadros and Alex Oliver of Igloo Studios have thrown in a one year Pro Account membership to the SketchUp School website for the first place winner of the pumpkin carving contest, and a one month Pro Account membership for the second place winner! Check out the SketchUp blog post all about it HERE. Good morning, SketchUp Islanders! And spooky morning, too. Mwah-ha-ha! You may have noticed that the new autumn holiday header art has arrived as promised. I created this illustration not just to decorate the blog, but also to commemorate the contestants who have entered the Pumpkin Carving Contest. Thanks to all who have done so! Anyone can enter before October 24. Just carve a virtual SketchUp pumpkin, upload it to the 3D Warehouse before October 24, and include the tag "sketchupislandpumpkins2009." Our judges will rank three top pumpkins, and those pumpkins will be added into the blog's header artwork for the Halloween season, along with the names of the three winners! 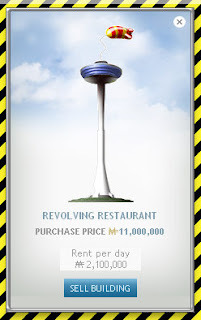 NOTE: The header illustration was created with Google SketchUp and image editing software. Everything is "from scratch" and no photographs were used. Beryl Reid will be one of our judges this Halloween in the pumpkin carving contest. Be sure to enter a pumpkin design by October 24 so that Beryl can check out your work! My interests [are] Art, Photography, SketchUp, Genealogy, teaching, paper sculpture, learning new things... the usual. I just found out that I am going to be a grandmother, so that's taking front runner in the interests list right now. I am a Google Certified Teacher too, I teach Google World to my school system. I was trained by Google in Boulder this summer, now I am set forth to spread the word of all the great apps created by Google. 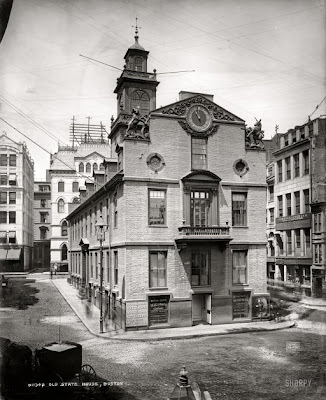 My little "Literary Landmarks" collection of buildings is now featured on Google "Lit Trips", which I am very proud of and I live in Massachusetts. PS. 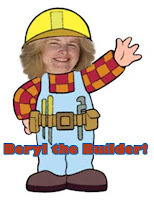 She's called "Beryl the Builder" because of the number of quality 3D models she has built on Google Earth. Check them out HERE. She did a couple pumpkins, too! Last but not least, congratulations on your good news, Beryl. This is kind of hilarious and cool, too. To get into tiny, interesting spaces that the Street View Car can't get to, Google has invented the Street View Tricycle (Trike), a high-tech, picture-making vehicle manned by an athlete. Watch the video and then follow the link to give your suggestions for where to take the Street View Trike. But do it before October 28, which is the deadline for suggestion-taking. I've already suggested Longwood Gardens in Kennett Square, Pennsylvania (USA). So I've been sitting on a number of nice models which for one reason or another I just haven't gotten around to publishing them. Here's a sneak peek at one that's about two years old! Click the image for larger view. this was done using the "model me" kits put out by Google. In this case, the State Capitol of Minnesota was photographed from all angles one winter's day by some good person and then the photos were published as a Picasa web album. A marker was placed at the appropriate location and uploaded as a SketchUp file. Then I took those materials and made this model. I ran into some issues. Edges not forming closed loops, and faces not dividing when they should. I think I need to reduce the complexity. Maybe I'll start over and import the textures and certain pieces of geometry into the new model. In the meantime I've begun other new models which will go out first. Actually it's my first American building (in Philadelphia, PA) done with Google's new Building Maker program. 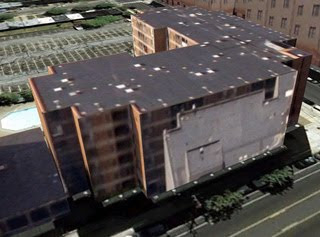 I heard that if you model a tall building whose image has "projected" onto another nearby model, that Building Maker will recognize this second building and remove its projected image from the first building. At the time of writing this model has that problem. Part of a neighboring tower appears on one wall. EDIT: I modeled and published that tower and so far no change on the shorter model. Maybe it takes more time? Jennie is a very cool friend of mine and a judge in this year's SketchUp Island pumpkin carving contest. Be sure to enter HERE before the deadline (October 24) for a chance to have Jennie check out your work and, if it wins, it will appear in the Halloween header artwork for this blog! Jennie has a fine arts degree that gathers dust as she works as an executive wrangler at a VA consulting firm. She comes from a long line of pumpkin carvers, and is still plotting her design for this year. She claims to have no recent accomplishments. 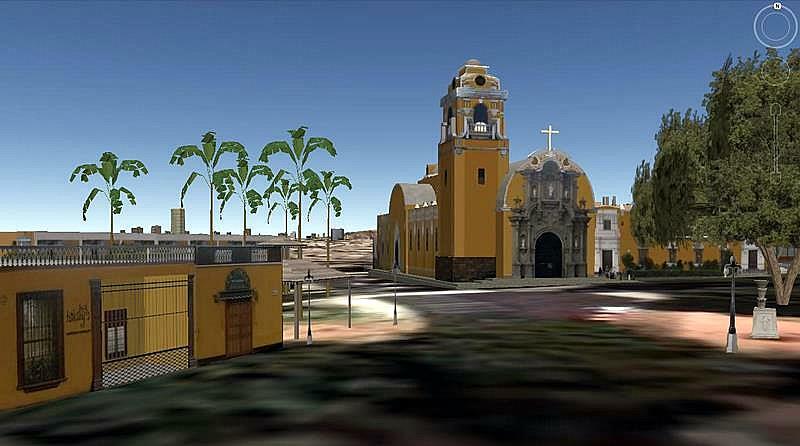 I have heard the idea tossed around of a "3D historic buildings" layer for Google Earth. Imagine being able to travel back in time in 3D and really get a sense of what a place was like years ago. If it were ever developed, a great source of historic imagery for modelers would be the Shorpy blog which I have mentioned several times before. Meet Zack Mertz, one of our pumpkin judges this Halloween in the pumpkin carving contest. If you want to learn how to hack the 3D view code (known as the SketchUp web exporter plugin) and customize it like Zack did, watch this YouTube video. Zack is a founder of and a 3D designer at Concept3D, based in Boulder, Colorado and Minnesota. He is an avid skier and a recent father. * EDIT: Scroll to the bottom of the post area to see the 3D pumpkin gadget Zack made. Thanks to Aerilius for the tip on how to make it work! And the winner is... I don't know! I am referring to the Monopoly City Streets building design contest. So many cool entries were made (I made thirteen myself). But who won? October 13 at midnight, winners were to be announced. I wasn't sure if that meant midnight at the start of October 13 (which is technically the midnight that happens on that date) or the midnight at the end of that day. Either way they've both come and gone and I can't find an announcement of winners. Has anyone seen anything? UPDATE: I won! Second Place with this model. Click on the 3D Warehouse logo in the image to check out Wurzeller's pumpkin up-close. Then from there click on the link to the SketchUp Island Pumpkin Patch collection and check out the other cool Jack-O-Lantern submissions we've been getting! There is a useful plugin by ruby-developer Fredo. His plugin Fredoscale allows to choose the direction of the scaling box in SketchUp. He has enhanced it with many additional features like tapering, twisting and bending. The plugin [first requires] Libfredo, and you only need to copy the files inside both zip-archives into the /Sketchup/plugins directory. It may be useful to make pumpkins look more natural and asymmetric. After a successful hunt in which three particularly vicious SketchUp Island pumpkins were rounded up and turned into pies and soup (enough to last weeks into the winter), I found myself feeling quite full and in need of a walk to shed some of those extra pounds. I turned my nose in the direction of the forest and stepped into the cool air beneath the trees. Suddenly I heard a terrible snarl behind me and to the right. I froze and then ever-so-slowly twisted my head around to see what it was. Just as I feared: a giant, vengeful pumpkin. I took a deep breath and I ran for my life! Dear Ready To Blow: Let's turn off the power main for a moment and examine our options. I can think of three ways to address this problem. If your own model is rejected for the reason "better model exists" then you can choose (at the bottom of your model preview page) to follow the link to tell Google "Why We Are Wrong." Secondly, if you come across an inaccurate model on Google earth, click it. In the pop-up window, click on "Report Inaccurate Model" and tell Google what's wrong. Better yet, the third option is to contact the model owner through the model preview page and tell them what the problem is. Autumn: a crucial time for pumpkin hunting on SketchUp Island. Our survival instinct takes over. We know the pumpkins must sustain us... If we can manage to catch any. You see, the pumpkins are tricky fellows on SketchUp Island. They slip away easily, roll under bushes and vanish. Some, when cornered, gnash their teeth and snarl. One needs stealth and focus to snare a pumpkin. And any SketchUp Islander knows that a true hunter of pumpkins must hunt by the light of the harvest moon. Dawn will be one of our SketchUp pumpkin carving judges this Halloween. If you haven't submitted your pumpkin to the SketchUp Island Pumpkin Patch yet, you might want to... soon. 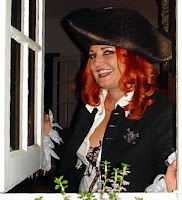 Otherwise Pirate Dawn will come and get you! Arrr! From time to time I like to show you what modelers are doing in mediums other than SketchUp. 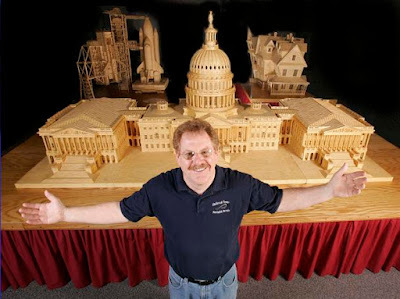 Modeler Pat Acton of Gladbrook, Iowa (USA) creates amazing buildings, ships, and even portrait busts out of matchsticks. Maybe this will give SketchUp artists some inspiration. In the illustration (seen HERE on his wife's website originally) we see Pat with his model of the United States Capitol. This model was made with nearly half a million matchsticks! Pat is a career counselor and does matchstick modeling as a "passionate hobby." See more models at his website, www.matchstickmarvels.com, and also at his wife's website HERE. Meet Addie Kay Boswell. 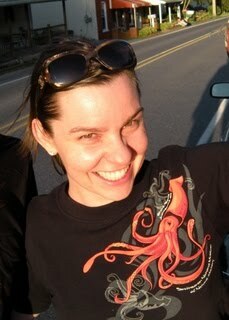 She will be one of our SketchUp pumpkin carving contest judges this Halloween. Addie is a painter and children's author/illustrator living and working in Portland, Oregon, whose picture book The Rain Stomper (illustrated by Eric Velasquez) was just awarded the Oregon Spirit Book Award. To enter the pumpkin carving contest and have Addie check out your work, enter the site HERE. Somebody made a different Pennsylvania Station for the Monopoly contest. Check it out. I also made one last week. My thirteenth submission to the Monopoly City Streets design contest. It's called "Donna's Arboretum" and it's named for my friend Donna who owns Samuel's Florist in Burbank, California. This model is a good example of when to use components. The building was built 1/4 of the way and then repeated. The trees repeat and so do the rocks (there is only one rock turned and resized to look like many) and the flowers (only one kind, dyed different colors) repeat as well. The pine trees are made from a single ring of branches that repeats vertically and is shrunk each time. Each ring is made of one unit that repeats in a circle. 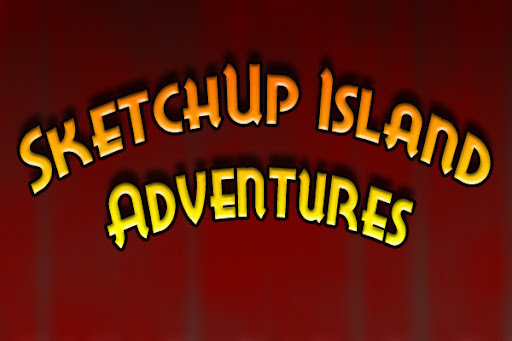 In keeping with the Adventurous spirit and theme of the popular "RSI" (Really Short Interview) Series, the series has been renamed SketchUp Island Adventures. The short interviews will be written in the style of pulp novels and/or 1930's radio broadcasts or something like that. It will still be a fun venue to get to know people in the 3D modeling world in an unusual way... with a different title. Keep your eyes open for two new SketchUp Island Adventures coming soon! What's cool is that there are many unique approaches to creating a pumpkin shape, really. I just figured out one way on my own. Below is a demonstration of another way that Googler Aidan Chopra makes pumpkins, using complex curves. Good question, Questioning. I'm going to try something new. Maybe some smart person out there can post an answer in the comments to this post. Meet Mike Tadros. He will be one of our judges this Halloween in the Pumpkin Carving Contest. When I got started in SketchUp I really had NO idea how to do it. I was not a "computer person." Luckily there was a great, free resource called The SketchUp Show (starring Mike T. and Alex Oliver) that I began watching on iTunes. It turns what might seem like a formidable subject for a beginner into something very approachable. Why is Mike dressed like a Power Ranger? See SketchUp Show episode #37 for the answer to this and other fashion tips from Mike. I call it "Coconut Milk Tower." Originally it was "Dairy Tower" because it is shaped like a carton of milk. But then I thought I would rename it "Soy Milk Tower" for the vegans. But then... I recalled that a certain vegan close to me prefers coconut milk. Hence, it became Coconut Milk Tower. 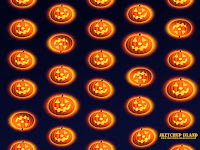 Go visit the pumpkin carving contest site* to get this really awesome high-resolution Jack-O-Lantern wallpaper for your computer! It's in the section marked "goodies." The full size image is 1200 X 1600 pixels and looks great on my 1344 X 1792 monitor. (Click thumbnail for preview size only). While you're at it, register for the pumpkin carving contest (see the site* for details). The winners will be featured in the new header artwork of this blog! "Happy Pumpkin" was designed using Google SketchUp and is the official mascot of the 2009 SketchUp Island Pumpkin Carving Contest. *BOO-HOO! Although the site is no longer live, you can still see all the cool pumpkins that were made in the 3D model collection HERE. The contenders are starting to march in to the arena for the pumpkin carving contest, and they look great! Want to win? Be sure to enter soon, because the deadline is October 24. For details on how to enter click HERE. The prize? Your pumpkin and name will appear in a new header illustration for this blog. The blog has had ten thousand (10,000) page views in more than 100 nations since late August, so your pumpkin will be seen by many people! But the bigger award is just doing it. It will definitely make you cool and maybe even get you a girlfriend or boyfriend. Trust me. Please remember to follow instructions carefully in order to win. 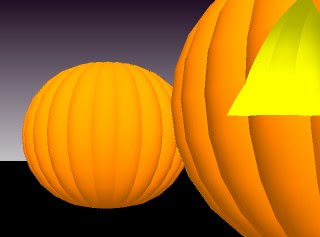 Include only solid colors (not photo textures); turn off edges and all geometry except SketchUp faces; upload your pumpkin as a "close-up" and don't forget to tag it with "sketchupislandpumpkins2009." I prefer that you light it for October 31, 2009, 8:00 PM from the bottom right (see top right example) but this is not absolutely necessary. Since the deadline for entry into the Monopoly City Streets game piece design contest has been extended, more submissions are coming in. Take a look at this one by BerylDrue, one of my favorites. SketchUp Island has a new Halloween mascot. His name: "Happy Pumpkin." Yes. Enter the 2009 SketchUp Island Pumpkin Carving Contest. * Your winning entry will appear in the new header artwork of this blog, in a rendered style similar to "Happy Pumpkin" but even cooler yet. The contest website includes tutorials on how to make a pumpkin and carve it, and cool stuff like stickers and note cards for FREE! You can't beat that. And if you're bored... see if you can find Happy Pumpkin on this blog before Halloween. He's hidden deep, deep in the blog somewhere. Once somebody finds him, I'll move him again. *Sorry! The contest site is closed. But, the wonderful pumpkin model collection can still be seen HERE. SketchUp Islander MILO Minderbinder takes the prize for "First To Enter" in the SketchUp Island Pumpkin Carving Contest. Check out his awesome creation below, and then enter the contest yourself! 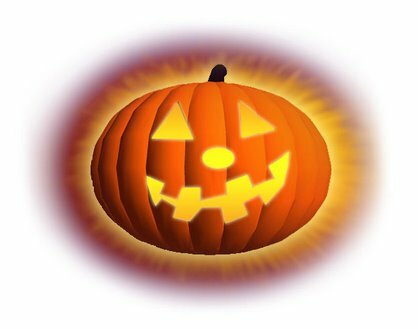 SketchUp Island Pumpkin Carving Contest Is LIVE! Carving a SketchUp pumpkin is as easy as 1-2-3. But what's more fun is making one and then carving it. And then winning a contest! Just follow this link to the new, official 2009 SketchUp Island Pumpkin Carving Contest website. 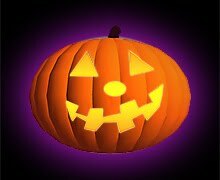 You'll learn how to make your own SketchUp pumpkin* (for intermediate and advanced users), how to make your own carving tools, and how to create and upload an awesome pumpkin for the contest (or, just for fun). Start now because Halloween is almost here! (deadline for contest entry is October 24, 2009). I hope to see the pumpkins rolling in soon! * Beginners don't need to make their own pumpkin. 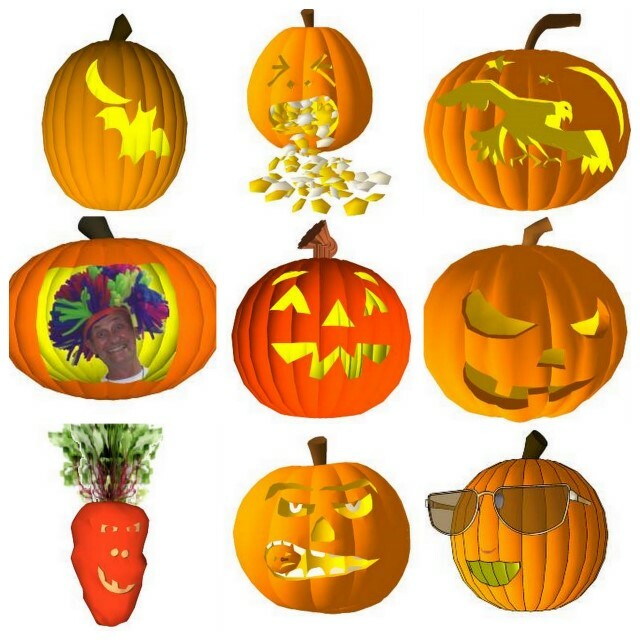 Visit the contest site to learn where to download pre-made pumpkins you can carve. Earlier this week a beautiful new SketchUp help forum was unveiled by Google with smarter, cleaner, question-and-answer formats. Readers will be able to vote for best answer for example and include rich content. This replaces the old Google SketchUp Help Group which will become locked in early October 2009. 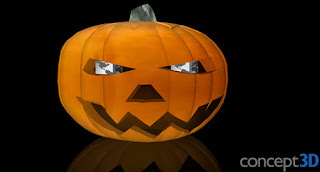 I just uploaded my first-ever YouTube video, which teaches intermediate SketchUp users how to make a 3D pumpkin for the upcoming Halloween holiday season. And, more importantly, for the upcoming 2009 SketchUp Island Pumpkin Carving Contest! EDIT: Contest website is LIVE. Check it out here and enter to WIN! (Beginners, you don't have to make your own pumpkin. Check the web site to learn how to download pre-made pumpkins you can carve). SketchUp Island Blogged On Infrastructurist! Check out this very cool blog post by Infrastructurist. Jebediah Reed, editor at www.infrastructurist.com, responded to a comment I had made on his blog about the old New York Penn Station. He kindly invited me to share my Penn Station SketchUp model on Infrastructurist, and he also blogged about the Monopoly City Streets game (for which the model was created in a design contest) and SketchUp Island. Check out the post here. Thanks, Jebediah and Infrastructurist. The deadline for the Monopoly City Streets game piece design contest has been extended to Tuesday, October 6, 2009, at 11:59 PM EST. See the blog announcement here. Time to make some models!!! 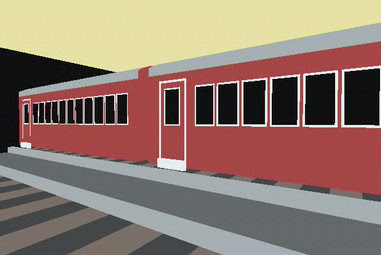 Somebody named Colin Holgate has created an animation based on my Penn Station model. He describes it as what happens when Spider Man is late for a train and can't find a way in to the station. See it here. 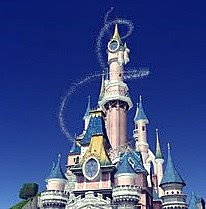 Still wondering if there will be a 3D Harry Potter theme park on Google Earth like Disney's parks are in 3D. Here's another 3D fly-through of the Harry Potter park, although pretty short... seems they are keen on the idea of 3D models, anyway. In case you missed it, way back in May 2009 Disney unveiled its beautiful 3D model of Disneyland Resort Paris on Google Earth. The entire thing is in high-detail, colorful, 3D goodness with animated, musical, pop-up windows that can help you plan a trip or learn more about the park. According to the post, 85,000 photos were used to re-create the park in virtual 3D form! That is mind blowing. What looks good? The Sleeping Beauty castle is especially well done (of course). See the illustration. Also Alice's Curious Labyrinth, Swiss Family Robinson Tree, and well, basically everything. Does anyone know if they plan to do the rest of their parks? (Florida was done in 2008). If you haven't seen it, I suggest downloading Google Earth and having a look around. Maybe you'll be inspired to plan your next vacation there! I would love to see Harry Potter in 3D on Google Earth, but in the meantime I found this very cool video. It is a sepia-toned 3D map of the park (in the style of the Marauder's Map from the stories). The map is animated and gives you a tour of the park, with atmospheric music and conceptual art of the details. 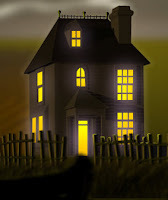 My seventh submission for Monopoly City Streets design contest... a house based on the look and feel of the children's story "Goodnight Moon" by Margaret Wise Brown, with illustrations by Clement Hurd. Here is my fifth entry into the Monopoly City Streets design contest: I call it "Shortcuts Barber Shop." Happy autumn to SketchUp Islanders in the northern hemisphere, and happy spring to those in the south! Since I'm up north I decided to share an autumn tradition with you all, which is pumpkin carving. Except of course this will be SketchUp pumpkin carving. The plan is to make a tutorial on how to design your own pumpkin. Then I'll also upload several of my own. And best of all, I'll have a contest for the best carved pumpkin on the 3D Warehouse! That is, if enough Islanders are interested. What do you think? Keep an eye out for an announcement and the rules for entry! Too Cool For Pvblic School! Here is my second entry into the Monopoly City Streets design contest. What do you think? Some of the best submissions to the Monopoly City Streets design contest are by BerylDrue. Check out the teapot themed one below. When I made my coffee cup model I swear I didn't know about this one! I think it's much better than mine, anyway! Personally this is my favorite kind of coffee cup and I'd love to go to a cafe shaped like this. EDIT: This style of architecture (buildings that look like objects) is called "programmatic architecture" or "mimetic architecture." Read all about it at Wikipedia. I've decided to enter the Monopoly City Streets building design contest! It should be fun, and I want to take a "different approach" so I'm doing some object-shaped buildings. Just for fun. If you want to enter you have until September 27 to do so. Wish me luck and good luck to you too! Dear SketchUp Island: Model "Failed Processing"
Dear Failure: Failure you are not! On certain occasions it is perfectly normal for a model to fail to be processed through the "3D Pipeline." Google is working out the kinks, but in the meantime there are some things YOU can do to reduce the chance of this happening to your model. Just follow this link to the Google SketchUp help pages! Dear Perfectionist: It's great that you are re-editing your models to improve them. But please, don't do it the way you've been doing! This can confuse the 3D model acceptance pipeline (for Google Earth) and cause pandemonium for you and your models. The proper way to edit an already existing model is to download it from the 3D Warehouse using the "edit model" link found on your own model's preview page. Do your edits in SketchUp and then re-upload. Don't delete any models. Don't duplicate any models. Just download from the link, edit, re-upload. Hope that helps! Dear Frustrated: Smooth your furrowed brow and take solace in this advice. At the bottom of every model preview page is a "3D Buildings Review" section, where the status of your model is posted. This could be accepted to the 3D buildings layer, awaiting review, or rejected. The process is mostly accurate, but not always. If you feel the reasons for rejection were inappropriate, there should be a link called "Tell us why we're wrong." Click that and tell the Googlers what the mistake was. It should be remedied soon enough!